Bring the stock to a simmer with a little black pepper. Whisk in the cornmeal and lower heat. Cook for about 10 minutes on low whisking almost constantly. Taste to make sure it is salty enough and not gritty. Spread onto an 8x10 baking sheet that is lined with parchment paper. Top with more parchment and press down to make it even. Put it into the fridge overnight. Remove your polenta from the fridge and get it out of the pan and onto a cutting board. Cut the polenta into 8 pieces. Load up half of the pieces with the cheese, basil, and red pepper, and put the other halves on top to build the sandwiches. On a medium high heat, grill the sandwiches for about 5 minutes a side. When it is time to flip, make sure to get a nice clean scrape from the bottom because the browned layer likes to fall off. Allow to cool for 5 minutes. Cut your sandwiches into nice little triangles before serving. 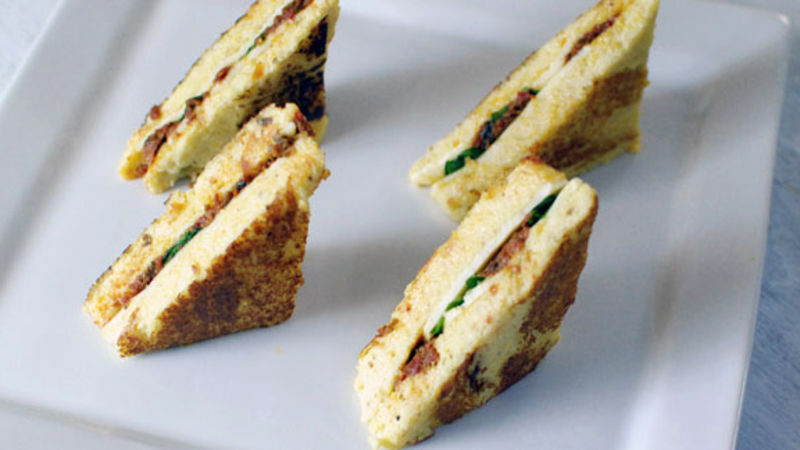 Try these Polenta Grilled Cheese sammies for your next party! I’m always trying to come up with fun new apps for parties, especially around the holiday season. My go-to is usually crostini, but recently a few of my friends stopped eating wheat. So, I played around a bit with polenta to get a nice firm bready texture from it – and I think I’m on to something! I recently used this bready polenta for some Mini Polenta Grilled Cheeses. To make them extra festive, I put some basil and roasted red pepper in there for the red and green color I love this time of year. Make these for your next party, whether people are gluten free or not, and no one will be disappointed! To get started, whisk the cornmeal into chicken stock and cook it until it is very thick. You can just spread this out onto a baking sheet and let it chill overnight. The next day it's nice and firm. Top with cheese, basil, and roasted peppers. Hot grill for a few minutes a side. Cut them into nice small triangles. Then line them up onto a plate! Dan Whalen ate one too many of these little sandwiches. He has been blogging for over 5 years at The Food in My Beard. Check Dan's Tablespoon profile often to try his recipes with creative international spins!